This spearmint has captured our hearts with a large leaf on a robust plant that is the basis for that little ole southern drink, the Mint Julep. 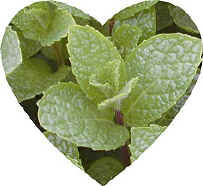 Kentucky Colonel Spearmint can be used in any recipe calling for spearmint, including mint sauce and mint jelly. Put the sugar, water and mint leaves in the bottom of a glass. Mash with a spoon until the sugar is dissolved and the essence of mint is extracted. Fill the glass with ice. When frost forms on the outside, slowly pour in the bourbon, letting it trickle through the ice, then stir. Garnish with a sprig of mint. (very important for the fragrance influences the palate). This recipe is from Maggie Oster's Book Recipes from an American Herb Garden. She in turn gives credit to John Egerton's book Southern Food. 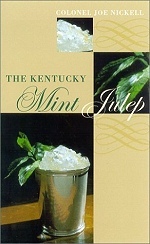 The Kentucky Mint Julep by Colonel Joe Nickel is a small book full of history, lore and recipes. Who knew there could be so many different ways to create this simple drink? Sections include several pages each for Historical Juleps (dating back to around 1898), Modern Juleps (frozen juleps sound perfect for summer or punchbowl juleps for that herb dinner or barbecue) and non-alcoholic Juleps (just enjoy the mint). It is after all about the mint. Our Kentucky Colonel Mint is the mint of choice for both the Julep and the Mojito, a Cuban version of the Mint Julep. Check out lots of herbal cocktails. Like all mints, Kentucky Colonel Mint, should be confined to a pot. 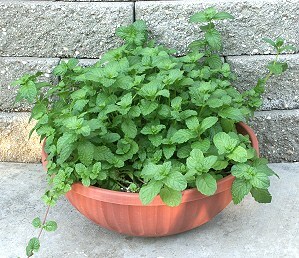 Mints grow better in pots that have a wide surface area rather than a lot of depth. This 14 inch color bowl makes a perfect mint pot, at least for the first year. After that, your mint will need to be divided and repotted with fresh soil each spring. Kentucky Colonel Mint iwould make a great addition to our Tea Herb Garden. This plant is often available in plug trays. These trays hold 128 of all the same plant. They are a great low cost way to fill a lot of space. Each cell is 3/4 of inch by an inch. Check here to see if Kentucky Colonel Mint Plug Trays are available.